Astronomers have found thousands of exoplanet candidates over the years, but don't let that number fool you - it's not an easy process. Even the most powerful telescopes on the planet can't just focus on a planet and snap a photo of it for the 'gram. One of the more common ways exoplanets have been found is by observing the dimming of their parent stars as the objects pass between them and us. According to The Atlantic, there is a new method that involves removing stars from the equation, and it may be a total game changer. "Stars are millions to billions of times brighter than the planets that orbit them, and their bright glare completely outshines the faint light of these planets," said University of California, Santa Cruz astronomer Henriette Schwarz. So one way to see the planets would be to eliminate the glare. That is not physically possible (we can't just move stars around), but it is with imagery and the right information. A team led by University of Bern in Switzerland astronomer Jens Hoeijmakers searched every pixel of archival images of the star Beta Pictoris taken by the Very Large Telescope (VLT) in Chile to test the new method. First, using spectroscopy, they separated the light wavelengths from the star into a spectrum. The spectrum gave them the chemical composition of the star, which they then cross referenced with signals for carbon monoxide, water, methane, and ammonia. 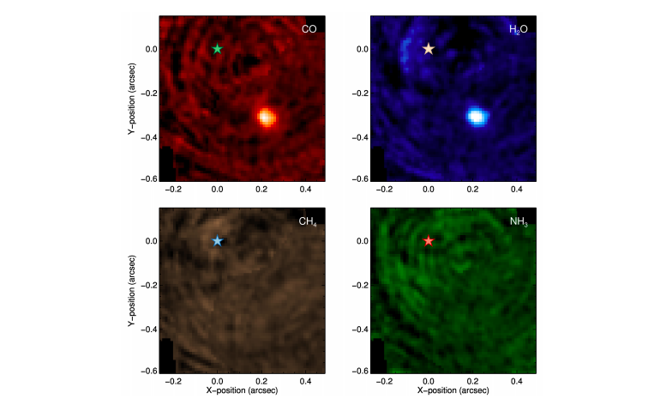 Beta Pictoris has an exoplanet named Beta Pictoris b, which remained invisible when the researchers searched for methane and ammonia in the star system, but suddenly appeared in the images when they searched for water and carbon monoxide. "I was scrolling [through the images] and the planet just popped up," said Hoeijmakers. "All your signals usually are very, very small, and you have to make a lot of effort to tease them out of the data. You're lucky if you see something. But in this case, it was completely clear. It was crystal clear." In the molecule maps below, the corresponding molecule is written in the top right corner of each image, and the star icons represent the location of the Beta Pictoris. The researchers point out that this isolation method only works if the star and its exoplanet have different chemical compositions. It is also more of a categorization method and not a detection method. It would take an impossible amount of time to search every pixel of every VLT image hoping that an exoplanet is there waiting to be spotted, but using the method in systems where candidates are known to exist could give astronomers a better view of them and change the way they are studied.